The Ministries of the Church of Christian Liberty have been supporting parents in their Biblical responsibility to provide their children with a Godly education for over 40 years. Tens of thousands of student have benefitted from the Christ-centered educations through CLASS Homeschools, Christian Liberty Press, Christian Liberty Academy. It is the desire and mission of Christian Liberty to partner with parents to provide top quality, Christ-focused educations for their children to train our students to be salt and light of the world and well equipped defenders of the Christian faith. Please take this opportunity to support Christian Liberty and our continued commitment to our students. 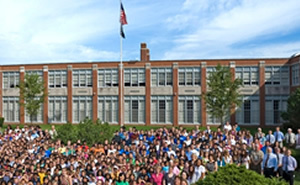 Christian Liberty Academy is our local private Christian school which serves about 500 students, located in Arlington Heights, Illinois. CLASS is our homeschool program consisting of thousands of students throughout the United States and around the world.